We have the vehicle lift for you! Regain your independent living! Call us to get a free quote on a Bruno stair lift today. We are a family owned and operated company that looks forward to building lasting relationships with all our customers. Would you like to stay up to date with our latest newsletter? Sign up for our newsletter and receive tips and offers directly in your inbox! Have additional questions or need a quote? Contact us today for your free consultation! Welcome to Access Mobility, where you’ll find affordable quality solutions for all your home health, mobility and accessibility needs. We are a family owned and operated business that has served central Indiana since 1971. With a true focus on customer satisfaction, not insurance coverage, Access Mobility will always strive to provide you and your loved ones with superior products and the best buying experience possible. Because we are not driven by what Medicare may or may not pay for, we can listen to you and your unique needs without the burden of red tape. 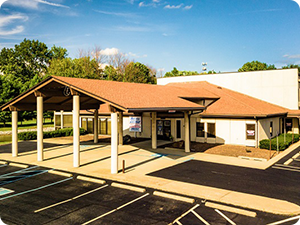 Stop by our facility, conveniently located just off of I-465 on the South side of Indianapolis, and take a look around. We have one of the largest showrooms in the Midwest. Raining outside? No problem! We have a huge covered canopy out front to keep you dry! Many of the products we keep in stock are items that can't be confidently purchased online. Lift chairs should be sat in. Exactly for this reason, we have over 30 lift and recline chairs on our showroom floor to help you pick out the ones that best fit your needs. We have dozens of scooters on hand with plenty of room to drive and compare each model. There are also working stairlift models on display, ready to ride. Certain stairlift chairs are even kept in stock to allow for fast installation, sometimes in as little as one day! Stairway lifts that are approved for public applications are also available. Access Mobility also features a complete bath safety department, outfitted with several grab bars and rails already installed on our demonstration tubs and commodes. Seeing these products in place can help connect the dots of how this equipment really works. Customers have also found our working vehicle lift models to be a great help when deciding what style of scooter lift works best for them. Access Mobility is always on the look out for the newest gadgets and product improvements to add to our offering of helpful aids. We work with our customers you to ensure the products they choose are the best choices for their needs. Come in and take a tour of our facility. With vendors like Bruno, Nova, Golden and Pride, our vendor network consists of some of the best brands in the industry. Many of our customers exclaim "I had no idea you carried so much!" -- You really must see it to believe it. With well over 100 years of combined experience, the Access Mobility team is one of the best in the industry. Our full service and repair department, sales team, accounting and management teams are all under one roof, making us the true one-stop-shop for mobility and accessibility solutions in the state. In addition to our enormous product offering, we also have many rental options to assist those needing short term solutions. Access Mobility sales and service is offered from Richmond to Terre Haute, Kokomo to Seymour, and all of Indianapolis metro. Access Mobility understands that living with certain medical conditions or recovering from injuries and surgeries can be difficult to cope with. We also know that shopping for specialty products can be frustrating. Let us help you rediscover the confidence that comes with independence. Venture to work, play, school, or wherever your imagination takes you. With the right products, nothing will slow you down! We look forward to meeting you and continuing our motto of "Helping People Help Themselves!" Our Family of Customers Have Spoken! "Access Mobility had the best price, the installation was on time, very professional and considerate (as quiet as he could be, so as not to disturb), well executed with care from our home, and the equipment was in good shape and worked exactly as we needed. This is a family-run business with a father/son and their field teams, and the attention to customer service showed." "My lift chair needed service and Caleb was able to fix it. He was so nice and courteous. I am very pleased with the work done." "Marc is just the most professional person, he really knows what he is talking about, a pleasure to work with"
Just wanted to say I really appreciate Brett and the way he handled our lift chair delivery. He was very very thoughtful and very nice. "Thank you for your help in purchasing my new mobility scooter. Also please thank your service staff for their help with my lift. I look forward to using my new ride!"